The Rebel Sweetheart. 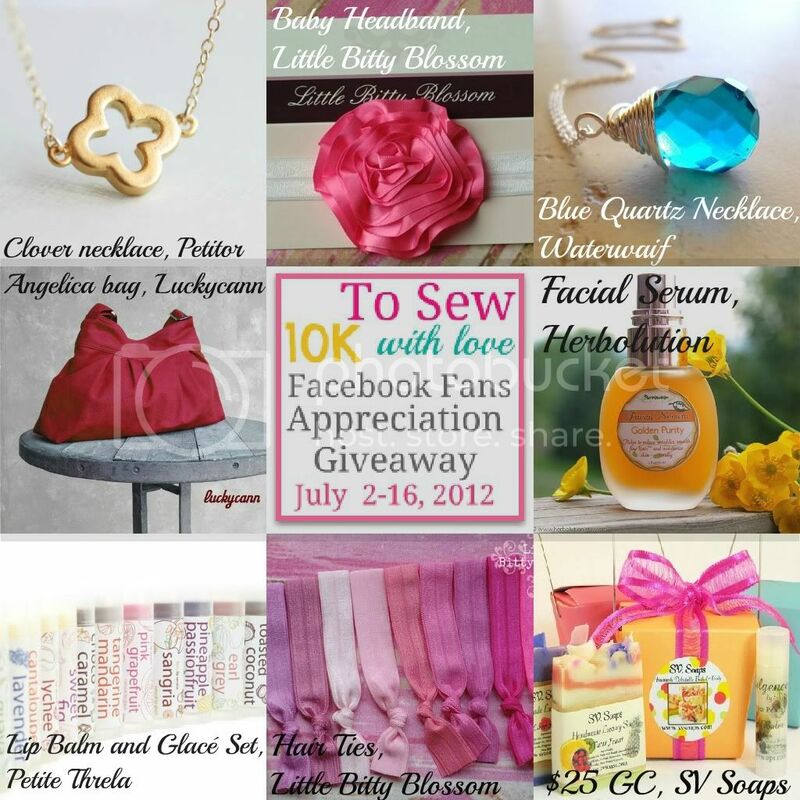 : Join | To Sew with Love Fans Appreciation Giveaway! Join | To Sew with Love Fans Appreciation Giveaway! To Sew With Love is commemorating a new milestone and they wanted to celebrate this by holding a giveaway to thank all of their readers. THE REBEL SWEETHEART didn't want to miss out on the fun either so we teamed up with them to bring you this fabulous Handmade Love giveaway! That is almost $175 in handmade goodies plus free shipping wherever you are in the world! This giveaway is open worldwide, includes Free Shipping (except for the Gift Certificates) and ends on July 16, 2012 11:59 PM EST. You should be 18+ to be able to participate. Make sure to do all of the mandatory entries because the entries will be verified. If your mandatory entries are void (for example, you click "I DID" without really doing the task) all of your other entries (optional) will also be considered void thus, you will miss any chances of winning the prize package! You wouldn't want that, would you? So, don't waste your entries! Completing the mandatory entries might seems exhausting but remember, you don't have to complete them in just one sitting. You can come back later and just resume from where you've left it! Winning could never be easier than that! To enter, just fill in the Rafflecopter entry form below. Please wait for the form to load. If it does not load at once, just refresh your page. Once it has fully loaded, entering will be easy-peasy! An email address is required to enter. Giveaway will end at 11:59 EST on July 15, 2012. The winner will be chosen randomly through Rafflecopter Random Selector and contacted via email. A reply to the winning email is required within 48 hours before a new winner is chosen. The winner's entries will be verified -- please make sure you follow the instructions and submit the entries correctly. Only one person per household may enter. You do NOT have to be a blogger to enter. Open worldwide, ages 18+. DISCLAIMER: This giveaway is in NO way sponsored, endorsed or administered by, or associated with Facebook. Information collected is NOT collected by Facebook. In signing up for this promotion, participants release and indemnify Facebook from all liability. By entering this contest, you may be choosing to opt in to newsletters and other emails from To Sew With Love, To Cook With Love and/or it’s sponsors, opting out of emails does not jeopardize your chances of winning. To Sew with Love, The Rebel Sweetheart and/or other participating blogs are not responsible of shipping the giveaway prize. I like how handmade items are often more unusual and differen...all good things!